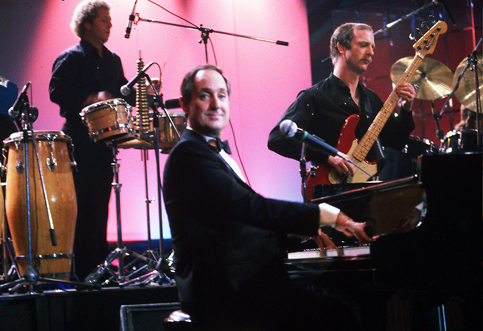 Neil Sedaka performing “La notte è fatta per amare” on the italian television show Blitz, Raidue, 1983. FROM CLAY AIKEN TO SAM SMITH: AIMING TO FOLLOW IN THE FOOTSTEPS OF THIS GREAT BUBBLING SINGER AND COMPOSER FROM NEW YORK. NEW STARS LEARN THE SECRETS OF SUCCESS IN INTERNATIONAL MUSIC. Neil Sedaka, Sam Smith and Clay Aiken. To emulate Neil Sedaka brings good luck and opens the floodgates to international success. 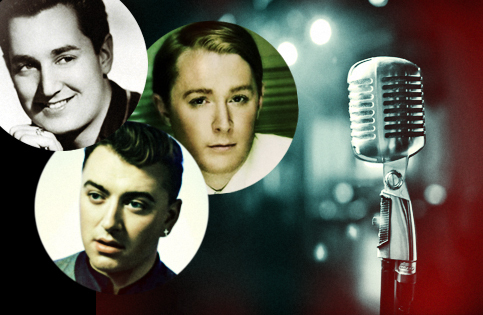 Young Sam Smith, born in 1992, has been quick to learn. He triumphed with no less than four trophies in the 2015 Grammy Awards in Los Angeles and in 2016 he won the Golden Globe (award) for the best original song plus an Oscar for Writing’s on the wall, the main theme song of the (James Bond) film ‘Spectre’. Sam Smith started out young in the cast of the 2007 British theatre musical “Oh Carol” which was inspired by Neil Sedaka’s never-ending repertoire. Of today, Sam Smith finds himself at the top of the Hit Parades both in Great Britain and the (United) States but he never misses a chance to reaffirm his esteem and gratitude to the great American master pop star Neil Sedaka who for more than half a century has turned out many worldwide hits and is still at the top, singing, composing and ‘bashing the boards’ in theatres all over the world. Long live the king! On the 13th of March 2018 he turned 79 years of age, for more than half a century he has been composing songs and patronizes the International Hit Parades all around the world: He climbed the charts for the first time in 1958 with ‘Stupid Cupid’ commended to the high-pitched voice of his friend Connie Francis. It was a smash hit that was played all over America 24 hours a day throughout the summer of 1958; The last time was with ‘Solitaire’ that in 2005 reached the top of the charts in the USA, interpreted by the very young Clay Aiken. ‘Solitare’ is a cover version of the song written and sung by Sedaka in 1972 and has been recorded by a host of pop-stars ranging from Elvis Presley, Petula Clark, Shirley Bassey, Sheryl Crow. During February 2010 the collection of ‘The music of my life’ the musical compendium of Sedaka’s career appeared in Billboard’s Top 200 Albums. Among the Golden Records in Sedaka’s house there are three that are entirely Italian, they are not translated versions of his American hit songs (at least 10 of his translated songs became sovereign on the Italian Juke-boxes), but they are original songs written by Italian songwriters. Among whom we find Luis Bacalov, who is was born in Argentina but his real home became the recording studios of RCA Italiana on the Via Tiburtina in Rome Italy. 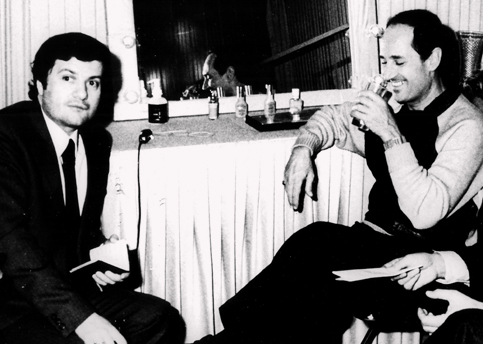 The songs ‘I tuoi caprici’ and ‘La terza luna’ (Waiting for never) were written by Luis Bacalov and Franco Migliacci, and the song ‘Adesso no’ by Gianni Meccia. All these songs in the early sixties became the hits that would defiantly bind the New Yorker to the Italian public. 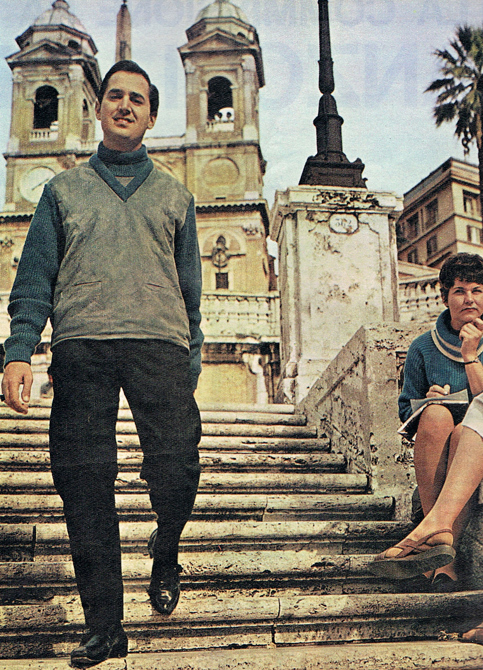 In Italian, Neil Sedaka has recorded fourteen 45 rpm’s and three Albums in which he actually conceded himself three songs of the Neapolitan songs repertoire: I’te vurria vasà, ‘Na sera ‘e maggio e Scapricciatello. 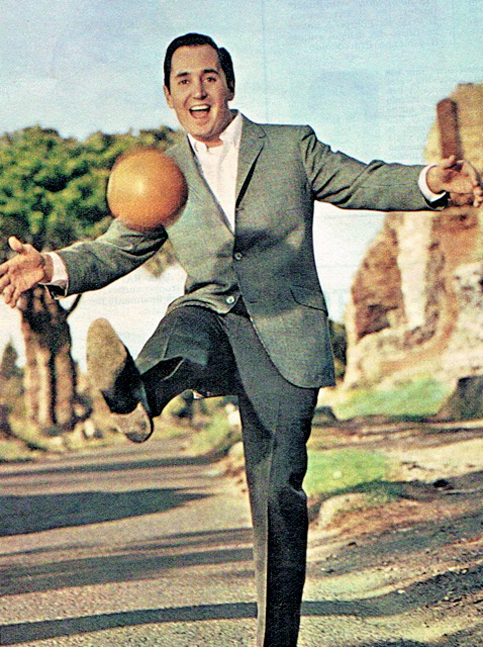 Neil Sedaka in Rome (1964): the Appian Way. Mr Sedaka, how did your Italian adventure begin? My first songs, ‘Stupid Cupid ‘and ‘I go ape’ had been enthusiastically received by the Italian public in their original versions. I still have the relative information: In 1959 Oh Carol remained for eleven weeks at the top of the Italian charts. My record company and publishers consequently suggested that I should re-record my American hits in different European languages. I consequentially recorded my songs in German, French Spanish and Italian. My grandmother was Spanish so I speak the language reasonably well and being similar to Italian, I found that my way of singing in Italian turned out to be pleasant and catchy. That is how my cover versions came into being: ‘Esagerata’ (Little Devil), ‘Un Giorno Inutile’(I must be dreamin’), ‘Tu Non lo Sai’ (Breaking up is hard to do), ‘Il Re dei Pagliacci’ (King of clowns). They were all hits. How did it go in the rest of Europe? Fine everywhere! Things also went well in South America thanks to the Spanish language. Later on I even recorded in Hebrew and Japanese. But the fireworks were in Italy: that’s where my biggest satisfaction came from. The cover versions seemed insufficient for the demand, so I started recording songs written by Italian songwriters. Luis Bacalov and Franco Migliacci wrote for me the two songs ‘I Tuoi Capricci’ and ‘La Terza Luna’. Howard Greenfield, a longtime friend who wrote the original lyrics of many of my songs, once said to me that I should be proud to have Franco Migliacci as my Italian lyrics writer, the man who wrote the legendary world wide hit song sung by Domenico Modugno ‘Volare’. In fact Migliacci actually managed to do a couple of miracles: ‘Another night, another heartache’, another song written by myself and Greenfield that did not get off to a good start in the States from the sales point of view, was transformed into ‘La notte è fatta per amare’ (The night is made for love) and became a big hit in Italy. On the rebound I made a couple hits in the United States with the English versions of ‘La Terza Luna’ (Waiting for never) and ‘In Ginocchio da Te’ (In the chapel with you) that Franco Migliacci and Bruno Zambrini had written together for Gianni Morandi. You did quite a few tours in Italy. What do you remember of the Italian audiences? Certainly not! They were right and I should have understood the audience right from the beginning. Maybe I should have tried Chopin at the end of the show so as not to put them off right from the start and I should have realized that they did not know of my musical beginnings as a classical pianist. I must say that some of my Italian fans were unlucky. At one show in at the Savioli Club in Riccione, I was taken ill with a bad case of bronchitis. Just two days before my concert the public had seen top quality singing with Mina and were expecting the same from me. I was practically without any voice at all but I really tried to get through the show. I had to give up after only fifteen minuets and I apologized to the bewildered public and then I had to hastily abandon the stage. Certainly not! For me it was a very real nightmare. My wife Leba was with me and we had to run faster than the very annoyed fans. We miraculously made it to our agents car and we sped away as tinned tomato came flying in our direction and bouncing noisily off the bodywork of the car. Another time in the beautiful open-air Greek Theater in Taormina Sicily I was supposed to sing live two songs that were to be recorded by the Italian television. Once again I had lost my voice and I had to do it all in play-back. I must admit that it was my fault because I have a high pitched voice and I did not realize how fragile it was. As I learnt later, I was not breathing correctly and was not dosing my diaphragm as I should have. Losing my voice was the result of my inexperience. Even though there were a few mishaps it seems that the Italian public remained faithfully enthusiastic. That is true! I got married in September of 1962 and soon after I arrived in Italy for a tour. But Ettore Zeppegno, One of the top directors of RCA Italiana who was following my tour step by step, asked me to present my wife to the public as my sister so as not to upset some of my over affectionate fans. At the Rome airport a young girl came up to me and kissed me and said: “Neil, at long last we have met in the flesh after our year long exchange of love letters”. Not knowing who she was I asked her, “What letters are you talking about?” She showed me a bundle of letters that she had in her hands and each letter was full of red hot passionate phrases. I saw straightaway that they were not written by me but I recognized the handwriting as that of my father who being such a nice person was happily and devotedly writing back to my lady fans trying to keep them all happy. You seem to have spent quit a lot of time here in Italy? On and off, Yes! I used to stay at the Hotel Hassler (Trinità dei Monti) overlooking the Spanish Steps with one of the most beautiful views in the world! I did seem to pass a lot of time in the recording studios. especially I also remember that did the music soundtrack for the film ‘Il Gaucho’ starring Vittorio Gassman. 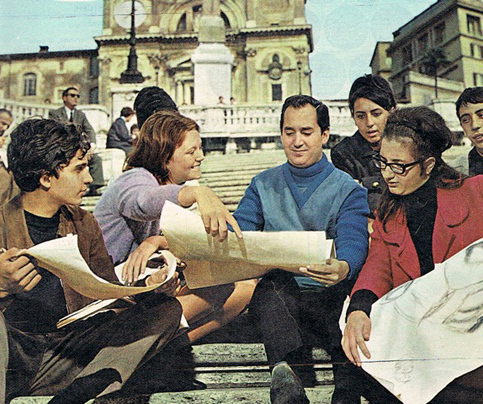 Neil Sedaka in Rome (1964): the Spanish Steps (Trinità dei Monti). 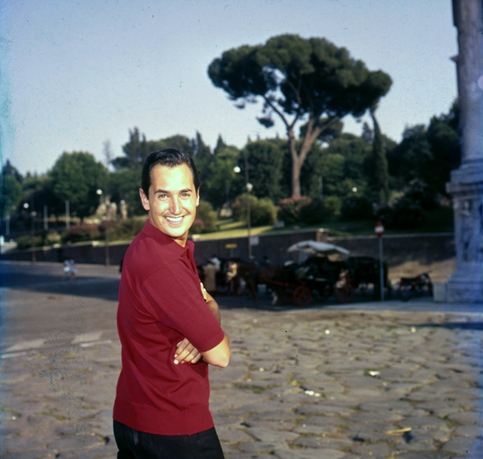 Neil Sedaka in Rome (1962): the Caelian Hill. Yes! I was supposed to do the 1965 Sanremo with the song ‘Non basta mai’ but that year RCA Italiana decided to withdraw all their artists from the festival because they had organized their own similar televised festival that they thought could counterbalance Sanremo. It was called ‘Pick-Up’. The Master of ceremonies was Walter Chiari and the singers were all under contract with RCA: Paul Anka, Rita Pavone, Gianni Morandi, Dalida, Alan Barriere, Jimmy Fontana and many others. What a good memory you have! Hat was a golden happy go lucky and fun loving period and I was on good terms with everybody. The only exception to that was the slightly hostile Gino Paoli. Maybe that was due to the record company was thinking of asking me to record his lovely song ‘Sapore di sale’. He was piqued. Quite rightly so: he wanted to sing his own song. I had nothing to do with it because I had absolutely no say regarding the policy or decisions of the record company. Over the last few years a famous Italian singer, Antonello Venditti with his song ‘Settembre’ has been accused of having copied from your song ‘I must be dreaming’ which in Italian was ‘Un giorno inutile’. Some say your song was plagiarized by Venditti. What is your point of view? I have listened to Venditti’s song and I think that although it seems reminiscent of my song one must remember how popular my song was in Italy when Venditti was a young boy. He wrote his song 25 years after my song and it is a fact that tunes do linger dormant in the recesses of ones mind and can pop up at any time. That is very complimentary to my song. Even if he had intentionally taken the idea from my songs I do not see anything wrong with that! Many of my earlier hits were inspired by songs of other singers that had unconsciously implanted themselves in my mind: Bobby Darin: Lloyd Price, Bobby Vee. The important thing is that one may get an idea from an other song but it then develops along a different track. Settembre is different from my song I must be dreaming. 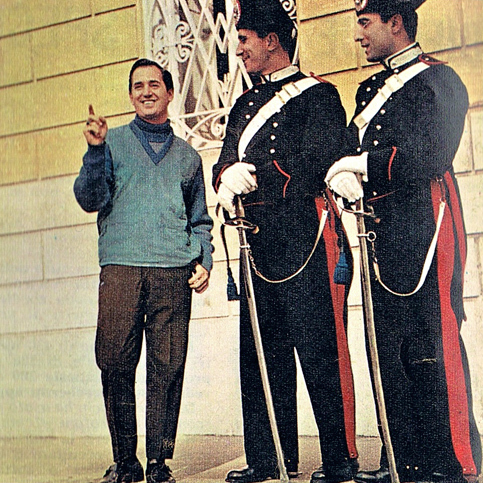 Neil Sedaka in Rome (1964) with two Carabinieri. Neil Sedaka “Breaking Up is hard to do” (Cinebox, 1963). [From the Pietro Bologna collection]. You have written more than a thousand songs! Which, above all is your favorite? Definitely ‘Laughter in the rain’ that in 1975 put be back in limelight after ten years of oblivion. With the advent of the Beatles and the British Invasion my success had waned. I had stopped singing but I pulled through by writing songs for other artists such as Tom Jones and the Fifth Dimension. Then Elton John signed me up to his record label: I had a windfall of a few hits high in the charts and from then on I have thankfully never looked back. I have two grown up sons, twin nieces, and a nephew who are my pride and joy and I am happy to say that I am always booked to sing all over the world. You have also had your songs in a recent Broadway musical hit. Yes! It is called Stupid Cupid and the story of American teenagers in the nineteen fifties and bounces to the notes of my songs. Another pleasant surprise popped up in England where one of my songs of the seventies ‘Amarillo’ sung by Tony Christie is the theme song of a successful television series and for many months it was high in the charts. Both Christie and I have decided to give the royalties to Charity: this decision to give to charity was because ‘Amarillo’ is a song that in the past has already earned me sufficiantly. In recent years two albums have been released with all my Italian songs. Obviously my faithful public has not forgotten ‘I tuoi capricci’ and ‘La terza luna’. On the other hand I have recorded in English ‘Nessun Dorma’ from ‘Turandot’ by Giacomo Puccini: it is entitled ‘Turning back the hands of time’ and it is part of a repertoire of classics from Chopin to Tchaikowsky that I have re-arranged, added lyrics and played together with symphonic orchestras in English and American theaters and also at the Carnegie Hall in New York. If I went back to Catania Sicily with a concert like this, then maybe this time I would not be booed and whistled off the stage. 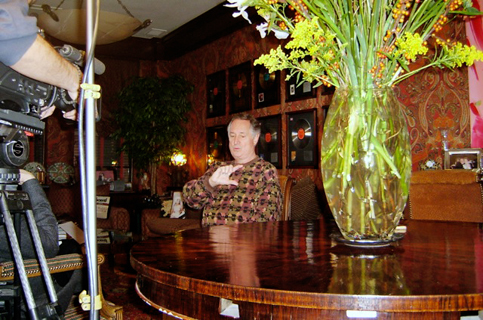 Neil Sedaka, Interview (New York, 2005). Neil Sedaka, Golden Record for “I tuoi capricci” (Look Inside Your Heart) (Rome, 1963). Neil Sedaka, “Tu non lo sai” (Breaking Up is Hard to Do) (“Alta Pressione” RAI, 1962). 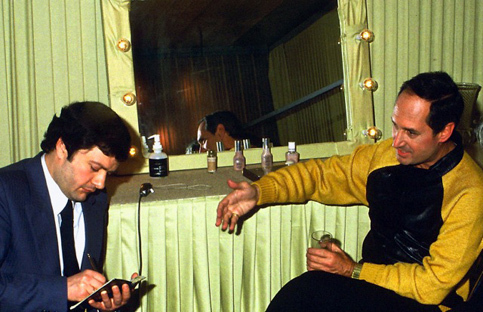 Michele Bovi interviews Neil Sedaka in 1984 at the Bussoladomani, Viareggio Italy. 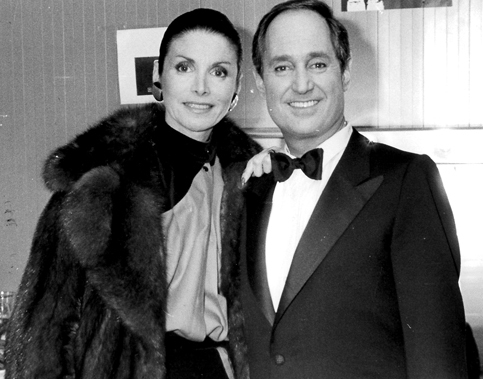 Neil Sedaka and his wife, Leba, in 1984 at the Bussoladomani, Viareggio Italy. Neil Sedaka and his daughter, Dara, in 1984 at the Bussoladomani, Viareggio Italy. 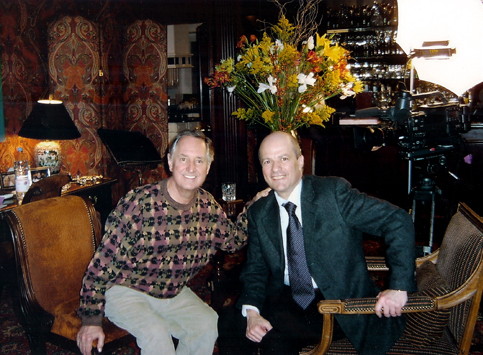 Michele Bovi with Neil Sedaka in 2005 during an interview in his home in New York.